Here's a fun Did You Know right out of your childhood toy box. 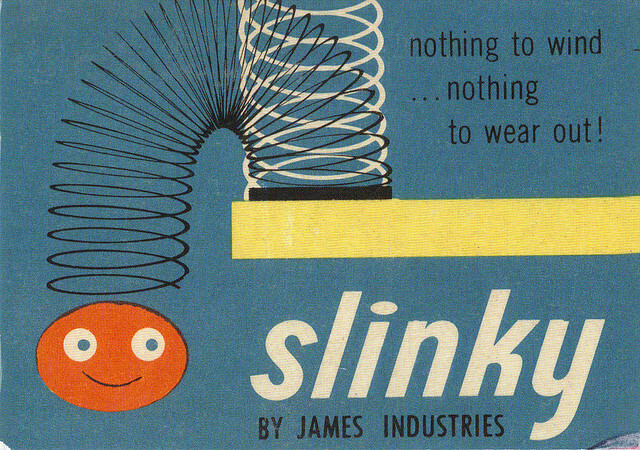 The Slinky toy was invented in the early 1940's by naval engineer Richard James. It was originally marketed in Gimbels depeartment store (Philadelphia), and it was an immediate hit. Richard James and his wife Betty marketed the toy until Richard left his wife in 1960 to move to Bolivia as an evangelical missionary. At that point Betty took over the company, and the business soared. The average Slinky has 63 feet of wire ... and it is the state toy of Pennsylvania. (Who knew that there are state toys? Neat!) I found a fun 1962 commercial for Slinky. Near the end of the commercial, you'll also see a cute Dachshund checking out a Slinky dog toy. 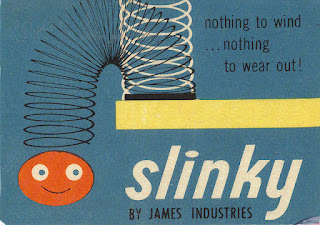 Do you remember Slinky? I'd love to hear from you in the comments! What an interesting story behind the Slinky! Do you know that I have never had a Slinky? I may have to buy one for the grandsons when they're old enough. Thanks Trish, for a very interesting post! Hi Mary! Thanks for stopping by. Your grands will love this toy. It is simple but still fun to watch! I feel like that means Pennsylvania is a really really fun state! I do remember the slinky it's amazing how long they have been around. My two little granddaughters have plastic ones, but I remember the wire ones. Thanks for visiting! I appreciate your comments. I enjoyed learning more about the Slinky history for this post.